Written by veteran flight attendant and writer Ji Byung-lim - On March 11, 2013, actor Song Joong-ki visited Qatar as an honorary ambassador for Korean Medicine. 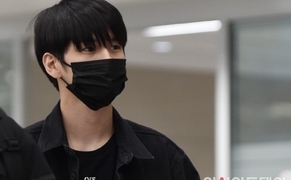 On the same day, he was scheduled to hold a fan signing ceremony along with his film screening at the Qatar Convention Centre. Hundreds of Qatar women wearing black abayas flooded in to the venue, where movie posters for Song's movie "A Werewolf Boy" were hanging all over. They cheered enthusiastically when this oriental actor appeared on the screen. Indeed, it was such a surprising sight. The organizers of the event, who did not anticipate such number of fans, also had a hard time dealing with more than 1,000 fans coming to the venue of 480 seats. Every time Song Joong-ki appeared on the movie screen, the women showed off their Korean skills, shouting out, "Saranghae! (I love you)"
I was beginning to wonder how these Qatar women got to learn Korean films and language. I approached them carefully and asked. "When I traveled with my parents on Qatar Airways, I watched Korean movies from time to time. I'm going to beg my parents to allow me visit Korea on my next vacation," one of the women replied as if she had waited. In 2013, the movie system in the cabinets actually featured a number of Korean movies, including "A Werewolf Boy." Until now, Qatar Airways' movie and music system has been updated regularly to showcase some latest Korean movies and music. Since Song's visit to Qatar, I have formed a habit of observing what kind of movie my passengers watch on the plane. Interestingly, I've found that not only Koreans, but also passengers from different countries had chosen Korean movies. From historical drama in which you learn about Korea's beautiful traditional costumes and history, to love stories between young lovers, Korean movies have been loved by people all over the world regardless of their genres. I often ask passengers who watch Korean movies about their opinion. Many of them tell me that Korean movies are absorbing because of well-structured plot. It's natural that passengers who watched Korean movies want to visit Korea by themselves. I meet many of them on a flight from Doha to Incheon. Whenever they find out that I'm a Korean crew, they come without hesitation and ask me to make a note of the attractions, clothing and cosmetics shopping stores, and famous medical institutions in Korea. It's very rewarding moment as a Korean working in a foreign airline. Only 10 years ago, not only did many passengers confuse South Korea with other Southeast Asian countries, but also were unaware of the difference with North Korea. It was a time when the understanding of my country was very poor despite the fact that South Koreans were allowed to enter the European and American developed countries without visas. However, as Qatar Airways grew in size and the number of routes expanded to over 150, it launched direct services between Incheon and Doha. Previously, its Incheon-Doha route involved a transfer in either Osaka or Shanghai. To attract more Korean passengers, Korean entertainment contents such as Korean subtitles, movies, music, and TV shows have been introduced into the in-flight entertainment system. Qatar Airways has more than 9,300 multinational crews in more than 150 cities around the world. Not it is not difficult to encounter one or two Korean crew members on any flight. No one can deny the fact that our young crews contributed to making such difference of today. Only a few years is left until the 2022 World Cup in Qatar. If Korean movies recommended by young crews become hit on the plane, and lead passengers to get interested in Korean food, products, culture, and tourism, this could be most powerful hallyu (or Korean wave) market. South Korea's poor economic growth rate is expected to remain somewhere in the 2% range next year. Although the government will continue to make efforts for its "2016-2018 Visit Korea Year" initiative, it's urgent to recognize young crew members working in the Middle Eastern countries such as UAE and Qatar as growth engines of national development. If you consider the youth and the people as supporters who are working together to overcome the economic crisis, it's already half done. *** Ji Byung-rim is a Qatar Airways cabin service director and the author of three books, including "How to Become a Crew of Arab Airline", "Thirty-year-old Crew', and "Charming Qatar." She also works as a mentor for K-MOVE under Human Resources Development Service of Korea.